SETTING: “The Minutes of the Lazarus Club” takes place in Victorian England in the late 1850s, and mostly follows the exploits of famous engineer Isambard Brunel and his disciple Viscount Ockham, son of Ada Lovelace, grandson of Lord Byron; and is told through the eyes of the young but already accomplished surgeon and Professor of Medicine, Dr. George Phillips. Many other notable Victorians appear in the novel as characters including Charles Babbage, Charles Darwin, and Florence Nightingale. FORMAT/INFO: Page count for the hardcover edition stands at 439 pages divided over thirty-eight numbered chapters, a Prologue and a short Epilogue/Postscript. On the front page there is a short Acknowledgements note that is actually part of the novel as Mr. Pollard reveals in his Penguin interview. Each chapter has a small picture related to its contents. Chapter one starts with a picture of a scalpel. The narration is first-person present time via the aforementioned Dr. George Phillips, while the London Times article quotes that appear in the novel were actually published in reality according to Mr. Pollard. The ending to “The Minutes of the Lazarus Club” is fitting and pretty much ties up all the threads in the novel. 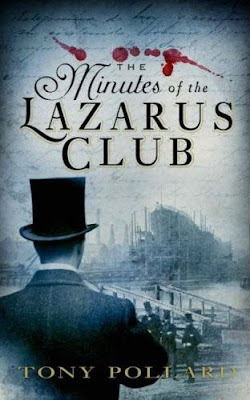 August 7, 2008 marks the UK Hardcover publication of “The Minutes of the Lazarus Club” via Michael Joseph. Cover designed by Henry Steadman with the photo provided by Hulton Getty. PLOT HINTS AND ANALYSIS: London 1857. We readers and lovers of “Victoriana” have a definite picture of what that means and this book does not disappoint starting off with some vivid descriptions of squalor, grime and a mutilated prostitute with her internal organs removed. Atmosphere set, we are introduced to Dr. George Phillips a young, up-and-coming surgeon at St. Thomas. He is going about his duties and cutting up corpses and parts thereof for the benefit of his medical students when a very energetic and familiar looking, middle-aged gentleman introduces himself. The newcomer is none other than Isambard Brunel, famous engineer whose exploits sell newspapers and are the talk of everyone in Britain—though recently his latest project, the world’s largest ship ever (known as the Great Eastern), has hit some unexpected problems in the launch preparation. Mr. Brunel is interested in the working of the human body, and especially of the human heart, and slowly he co-opts George Phillips into his circle. Alongside the young and widely regarded ”big, bad, mad” Viscount Ockham—son of the late Ada Lovelace—and Charles Babbage, friend and collaborator of Ada and surrogate father of Ockham, Brunel has organized a scientific club where even outrageous-seeming ideas can be discussed freely. Called The Lazarus Club for reasons to be revealed later, the club numbers among its members Charles Darwin and Dr. Sir Benjamin Brodie—President of the Royal Society and of St. Thomas, and thus, George's boss—with other luminaries like Charles Dickens and Michael Faraday appearing as occasional lecturers. Attending alongside George, who later becomes the secretary of the club because of his skills as a fast note taker, we see Charles Darwin giving a “preparatory” lecture of his revolutionary Theory of Evolution to the Royal Society before the before the major public introduction, and of course the attending controversies about what it all means and much more. But there are deep secrets below the surface of this eccentric yet otherwise harmless-seeming club—dangerous and even seemingly mad obsessions, although money and power are also involved. After all, science and technology evolved from such a confluence. So George is drawn deeper and deeper into this web, confronts ruthless killers, and makes friends that may be even more dangerous. All the while, his boss Sir Benjamin regards him as a potential rival and threatens to fire him, while the police are taking a close interest in George because of the numerous murdered prostitutes that are being recovered from the Thames. Luckily, George meets and befriends Florence Nightingale, which gives him some protection. After becoming so famous in Crimea, Florence is now in charge of making sure London hospitals are sanitary—to the despair of powerful men in this patriarchal society, Florence is almost as famous as the Queen herself so she can get away with “bossing” men. As one particularly obnoxious character puts it, “mark my words gentlemen, one day all (women) will be like her”. “The Minutes of the Lazarus Club” is full of plot twists and the action chugs along so fast and furious that you won’t want to put the book down. However, “The Minutes of the Lazarus Club” is a debut novel and has some flaws including the pacing, most notably the last part of the novel which rushes from one hairy escape after another while the villains are explaining their motives to the heroes, not to mention all of the other run-of-the-mill action stuff. But the narrative is so powerful and the characters so interesting that these are no more than minor niggles. Because of its gothic Victorian atmosphere/plot and its discussion on science, technology and numerous concepts that we use today like computers, genetic engineering, artificial organs, submarines, airplanes and bombing runs—the book is very sfnal and a paean to the powers & dangers of scientific thought and its technological transfiguration in reality—“The Minutes of the Lazarus Club” is the kind of novel that should appeal to lovers of both fantasy and science fiction. It is also a book that entertains but instructs at the same time, and it makes you want to go and read much more about that era and its personalities, wonders and tragedies—which is about as good as it can get for me. I like books with this kind of setting. So your review convinced me to add the book to my to buy to read list. For me - this being a UK import so not available for browsing here in the US - the excerpt, especially the first chapter where Dr. Phillips meets Isambard Brunel convinced me to try it and if you like the writing in that, you will like the book since it continues in the same style to the end. This book was recommended to me on Amazon UK, too. The professional critics have hated this one, but we all know how worthwhile their opinions are :-P. Very good review. I might just have to try it myself.